India won their first medal of Day 8 through Tejaswini Sawant, who finished second in the Women’s 50m Rifle Prone event with a score of 618.9 to clinch the silver medal. Her compatriot, Anjum Modgil, however, had a poor day in the office as she could only finish 16th on the table. A gold medalist in the 2006 Melbourne Commonwealth Games and a silver medalist in CWG 2010, Delhi, Sawant was one of India’s prime medal contenders in Gold Coast. And she started accordingly with a score of 102.1 in the series. Though it wasn’t the highest, as Isle of Man’s Rachel Glover managed 104.1 and Malaysia’s Nur Suryani Mohamed Taibi scored 104.4, it reflected the 38-year-old veteran’s confidence. Her next scores were all above that as she scored 102.4 in the second series and 103.3 in the third series. 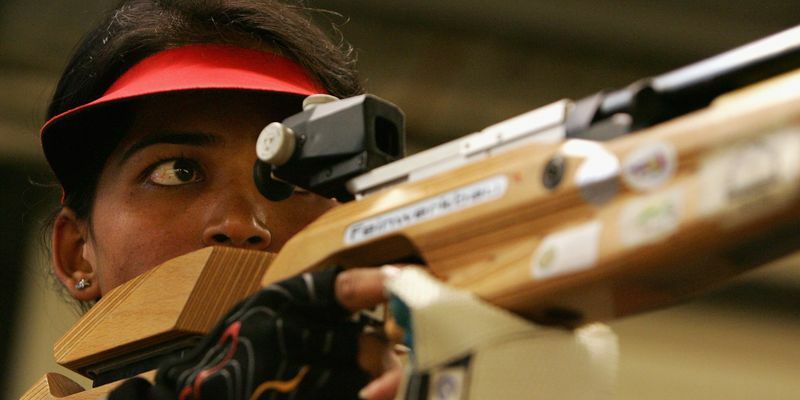 Consistency is the key to the Rifle Prone event and as Sawant kept on increasing her shots with every series, others like Glover, Taimi and more started dropping points and were highly erratic. Singapore’s Martina Lindsay Veloso was the other shooter who kept on improving and took the gold spot away from Sawant in the fourth series when she could manage only 102.8, whereas Veloso picked it up to 104.3. Though Sawant upped her intensity from there, she eventually finished 3.9 points behind the topper, Veloso. Veloso finished with a Commonwealth Games record of 621.0, while Sawant scored 618.9. India’s other shooter, Modgil, was a slow starter from the beginning in the final and never really got her score over 100 before the fourth series. She eventually finished with 602.2. This takes India’s silver tally to five and total tally to 25.